The e-commerce giant has gone on a hiring spree. Amazon.com (NASDAQ:AMZN) just keeps growing and growing and growing. The company blew past estimates in its first-quarter earnings report last week as sales jumped 28% to $29.1 billion and earnings per share improved to $1.07. Thanks to Amazon Web Services' tremendous growth and profitability improvements in the company's e-commerce division, Amazon posted its most profitable quarter in the company's history. Investors celebrated the headline numbers, lifting the stock more than 9% the following day, but one of the biggest signs of Amazon's emerging growth was widely ignored. Over the past year, its employee count has soared by 49%, to 245,200. Generally, an increasing headcount precedes revenue growth; in Amazon's case, investments in additional staff are necessary as the company adds new fulfillment centers, expands AWS, and makes other key investments. 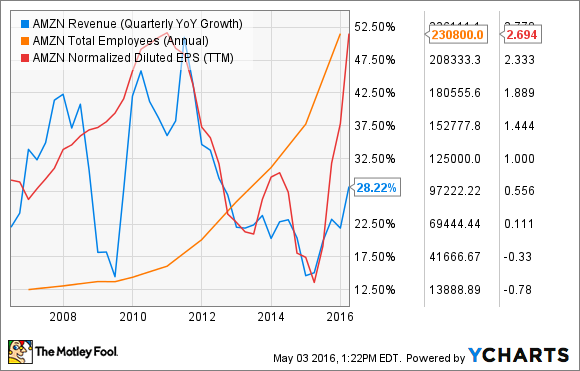 In fact, there may be no better indicator of expected sales growth than employee growth. Amazon's headcount has only grown faster than this at one other time in its history: from 2011-2012, when it reached a peak of 75%. As the chart below shows, Amazon's revenue growth was fastest in the last 10 years during the third quarter of 2011, precisely the period when its employee growth was the fastest. Notably, that investment in new staff coincided with a decline in profits, but we haven't seen that this time around thanks to AWS, which delivered an operating margin of 23.5% in the most recent quarter. Stock market-watchers may have noticed a pattern. When companies announce job cuts, often their stocks soar. The simple explanation is that investors cheer the efforts to reduce costs, assuming that a lower headcount will boost profits, but they're ignoring the bigger issue. Successful companies don't need to lay off employees, and companies that do so are usually weakening their long-term growth prospects rather than strengthening them. Tech titan of yesteryear HP (NYSE:HPQ) got a big boost in 2013 and 2014 with the help of layoffs as new CEO Meg Whitman slashed and restructured the company in hopes of saving the aging PC maker. On one particular session in 2014, shares rose 6% after the company announced plans to cut an additional 11,000-16,000 jobs. Just in March, Brazilian oil giant Petrobras (NYSE:PBR) shares spiked 12% on plans to reduce its workforce by 15%. 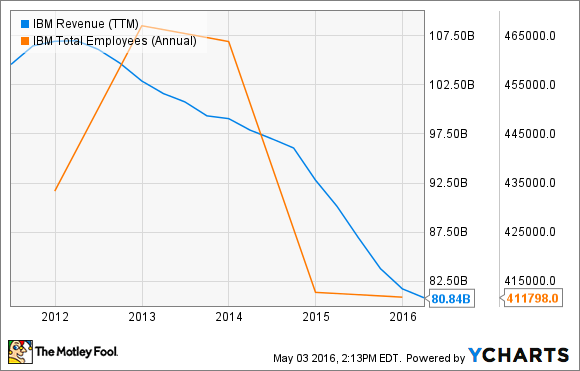 Perhaps no company has been more notorious for layoffs than IBM (NYSE:IBM), which has cut its headcount by more than 10% in recent years, as the company transitions into higher-margin cloud and transition businesses. Not surprisingly, those job cuts have tracked with 16 straight quarters of declining revenue. By adding 80,000 employees last year, Amazon is growing its headcount nearly as fast as any other company, and with continuing investments in office space in fulfillment centers, the company looks set for continued growth. As the chart below shows, Amazon's revenue growth has accelerated since 2014 as AWS and investments in new services like Prime Now have taken off. 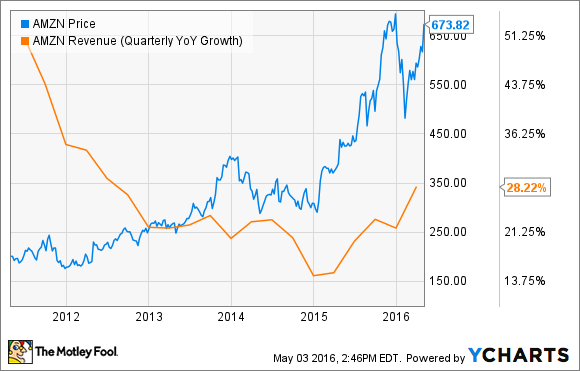 Amazon's growth is in a significant upswing, as the rapid headcount growth shows. Even with its market cap pushing past $300 billion, the opportunities the company is tackling in retail, cloud computing, and even video streaming are huge, and could enable the company to maintain its growth rate for many years ahead. Expect Amazon's headcount and sales to keep surging.